The town of Brunswick, where you’ll find the remains of Lock 30, is one of several towns with direct access to the Canal. In addition to the lock, Brunswick is home to a C&O Canal visitor’s center, a heritage museum, and a number of other attractions and amenities. The bustle of Brunswick has declined with the decreased activity of the railroad, but you can still take the MARC commuter train from Brunswick into Washington, and the town remains a charming outpost along the Potomac. 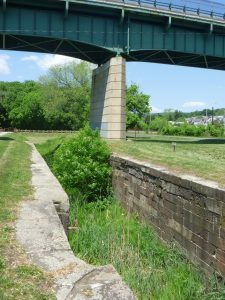 The lock itself is built of red Seneca sandstone, Patapsco granite, and some local stone. A historical marker describes a mill that was located near the lock and drew water from the bypass flume.